Ah, cats: we all know them to be self-sufficient creatures. They still need a little help sometimes, though. As owners, it's our responsibility to provide them with high-quality litter boxes, or pans. This helps them maintain their high standards of cleanliness. We've found some great products that we think cat-lovers will love. Read on to see our top cat litter box reviews! Our top featured litter box is the Good Pet Stuff Company Hidden Cat Litter Box. It earns a purrfect 10 rating from us here at Top10! What's not to love about this product? It doesn't even look like a litter box, for one; it can tuck nicely away in the corner of any room, and certainly won't create an eyesore in your home or apartment. 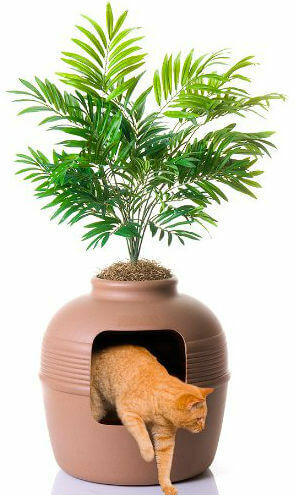 Designed for larger kitties, it stands 42-inches tall with the included plant. All owners have to do is assemble the pot, place the top plant and moss, and then add in their favorite litter. The only drawback is that this item costs $56.99 on Amazon. So, it's a bit pricier than the average litter pan. However, it's just so stylish that we think it's worth considering a purchase. The company is so sure of this box that they've even included a 1-year warranty on it. Those looking for a simple, easy-to-use litter box can find that in this PetMate Open Litter Box. The large pan goes for $7.29 on Amazon. The company offers this pan in two colors (gray and blue) and four sizes, so most cat owners will be able to find one that's appropriately sized for their fur baby. Earning a great 9.2 rating from us, this pan is also constructed with recycled plastic, so it's a purchase anyone can feel good about. The only drawback to this simple pan is that it doesn't have any added features to help trap odor. This is a high-sided litter box, but even so, kitties have a way of scattering litter. Those whose fur babies are particularly talented in this way might want to consider adding a hood or mats around their boxes. As far as aesthetics go, this item just a plain box, so it isn't much to look at. We have a tie here! 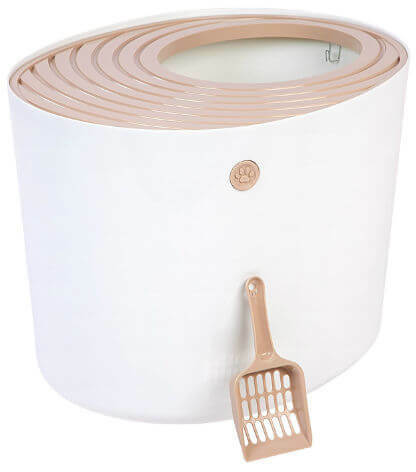 We really like the white-and-beige colored Top Entry Litter Box from IRIS as well as the ecoFlex Litter Loo from New Age Pet. The IRIS open-top entry litter pan has a simple yet stylish design that is also effective at trapping litter. Because kitties have to jump up out of this container, they will be less likely to track litter with them as opposed to a traditional floor pan. It's also pretty safe, as the company claims this product is BPA-free. A large one with a grooved lid currently goes for $36.08 on Amazon (litter box scoop included), and it earns an extremely impressive 9.9 rating from us. The Litter Loo is actually a litter box cover that can also serve as an end table. As such, all owners need to do is place their favorite pan inside, and then forget about it until it's cleaning time. What's nice about this piece of furniture is that it won't absorb urine and end up with that awful lingering smell. Coming in five different colors, this item earns a 9.3 rating from us. Interested individuals can buy a standard-sized model on Amazon for $66.45. 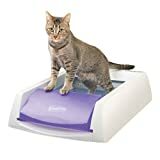 Those interested in skipping the scooping process entirely can check out our best automatic litter boxes list to see the top-rated self-cleaning litter boxes. If you're interested in learning more, read on for more information about how to pick out the best litter box for your cat! Having a place to take care of business is a central part of any cat's hygiene routine. It’s vital to choose a litter box that’s appropriate for the size of your cat, and also your living area. You want to ensure it’s clean on a consistent basis for health and hygienic purposes. In the following, we'll discuss different litter box options, as well as tackle the dirty act of cleaning litter pans. The style of litter box best suited for your cats can depend on their personalities. Some cats desire privacy while others enjoy the openness of big boxes. It’s also important to keep in mind that cat litter may get flung outside the box; some pans can reduce this litter flyaway better than others. Always choose a litter box relative to your cat's size. You want to leave enough room for your cat to walk around and get down to business. Fortunately, we live in an age where there's different types of litter boxes to buy, so owners can find the perfect cat pan to suit their needs! Like anything else, there's benefits and drawbacks to every variety. When most people hear the phrase "cat litter box," they are probably thinking of a simple, open litter pan. There's a lot of reasons to select this variety; this type of box is easy to clean, easy for cats to use, cheap, and lightweight, just to name a few. Some traditional litter boxes even have spouts that make pouring out litter easy. The open top means entry to the litter box is easy, which is great for senior cats. There are, however, some obvious drawbacks to even the best cat litter pan. For starters, open boxes offer less odor resistance and privacy than a covered box. Moreover, the lack of a top means that it is much easier for kitties to track litter around. If you go for a traditional box, there a few things that can help remedy these drawbacks. When choosing a traditional box, opt for a high-sided one to ensure your cat's litter doesn't easily escape the box. (Note, however, that high sides will make entering and exiting more difficult for senior cats.) Adding a hood or mats outside the box will also help catch flyaway litter. Hoods are an especially great accessory to consider besides just litter-catching. Coverings will also help reduce odor, and offer felines some extra privacy. Enclosed cat litter boxes are designed to offer a high level of privacy and better contain that disastrous kitty litter smell. Because there's only one opening (usually) for a cat to enter, this also means that kitties are less likely to kick litter out of the pan. However, sometimes kitties can still track litter out on their feet. As such, a litter mat remains a good item to buy. These boxes will often come with a handle that makes for easy transportation, too. 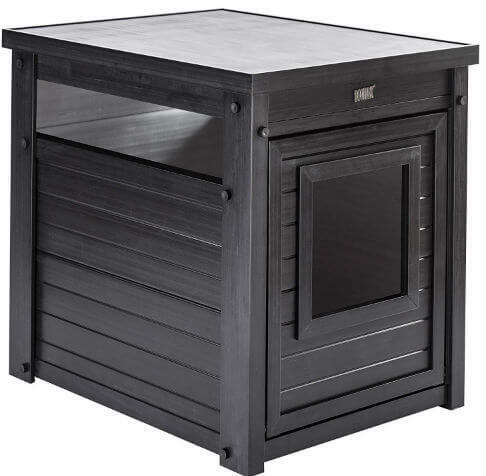 If your cat desires privacy, go for a closed or hooded litter box. Besides privacy concerns, some cats simply prefer the closed look. A cat's choice is largely based on individual personality, and—as we all know—cats have very strong personalities. When selecting an enclosed cat litter pan, make sure it isn't too small. Your cat will still need enough space to move around to properly conduct her business. While these pans are better at containing odor than open ones, odor control might still be an issue for some. Fortunately, many an enclosed litter box come with a carbon filter system. Carbon filters are great at containing odors and reducing the amount of dust that's kicked up by your kitty. They will need to be regularly changed, though, in order to be effective. Technology is a beautiful thing: there are now automatic litter boxes that clean themselves! This means owners can skip the annoying and oftentimes messy process of scooping cat waste. Automatic cat litter boxes use a sifting litter method to separate urine and feces from the litter. Most come with some customization options, like delayed timers. Waste will usually be kept in a separate container that create a notification once it’s full. All automatic litter boxes require of owners is emptying this container and adding new litter. Automatic self-cleaning litter boxes come in all sizes, but usually have a large entrance for large cats. They're often better for a multiple-cat house, and many come with long-lasting durability. The only drawbacks are that they are more expensive, older cats may find them intimidating, and they don't work with all types of litter. If these are not issues, though, an automatic litter box is a great option. They're very simple and make kitty maintenance easy! These are a little different than the last type of pan; these are self-cleaning boxes that are not automatic or electronic. Those looking for a cheaper alternative to the automatic litter box while still wanting to skip the scooping process can find that here! A self-cleaning litter box is effective, easy to use, and compatible with most kinds of litter. A manual self-cleaning litter box may look like a normal hooded litter box, but it comes with a few interesting attachments. There's a grill that separates waste from unused litter and places it in a separate container much like the automatic pan. The grill is connected to a manual roller. All cat parents have to do is crank the roller to move the grill across the pan. This sifting process will scoop waste into a separate container or bag. There's several other benefits to these pans as well. They tend to come in large sizes, so big cats will be happy. Plus, self-cleaning litter boxes are made from lightweight materials and are often covered in a coating that helps contain serious odors. These boxes have a lot to offer, but there are a few shortcomings. They are not fully automatic and require owners to handle them with care. Like their electronic counterparts, some cats may not enjoy the design of these manual boxes. While a variety of litter can work with these devices, self-cleaning boxes work best with hard-clumping litter, which may cost more money. Another kind of litter pan is the disposable litter box. If you're the kind of person that doesn't want to regularly scrub their cat's box down, then a disposable pan might be the best option for you. They are also wonderful if you are taking a road trip with kitty. They may not offer as many bells and whistles as the choices listed above, but they still remain an efficient possibility. You can easily throw them in the garbage whenever you want, no other clean-up necessary. The choice is yours! Unlike closed or automatic litter boxes, you can use just about all kinds of litter in a disposable box. Many are also often biodegradable! This is because many companies choose to make their signature disposable litter box from recycled materials, and use baking soda to lock in those nasty odors. Unfortunately, these boxes do not usually offer various size options like other kinds of litter boxes. They also still require you to scoop regularly to maintain your cat's health and wellness. Experts recommend replacing disposable litter boxes every 1 to 4 weeks, or sooner as needed. Replacement depends on the size of the cat, how many cats are using the box, and the amount of waste produced. What size should my litter box be? Once you've decided on the type of box you want, you’ll then need to find one that's the correct size for your cat. Your cat may not utilize the box if it's not the size she wants or needs! A box that is too small will leave some felines feeling claustrophobic, and it might not give them enough room to be comfortable. If the cat litter pan is large—and you have a claustrophobic kitty—she may feel open and vulnerable. If kitty decides to take her business elsewhere, that is a pretty good sign she does not find that particular pan to her liking. Size is also important because the box must be large enough to store enough litter sufficient for a cat's bathroom needs. Ultimately, you want enough litter for your cat to dig in and move around to its satisfaction. This will usually be a few inches. After settling on a box type and size, it is important to place it in an optimal spot. Many cats require privacy, just like people. Litter boxes should be placed in a private and quiet area. Having a box strategically tucked away in a corner can not only give kitty the space she needs, but it also means that it will be less of an eyesore for you. You also want to ensure it's in a convenient enough location for your cat to regularly access without your help. Your kitty deserves independence! How many boxes do I need for multiple cats? If you have a multi-cat home, you should definitely consider getting more than one box. The rule of thumb is generally one pan per cat, plus an additional litter box. Cats typically do not like to share. Even if a litter box is large, consider getting extra ones for multiple felines. This is one time that each kitty will want her own space, no matter how well pet siblings get along normally. Cat litter: This one is a no-brainer. You’ll need good litter to fill up cat boxes! Search for litter that clumps well and locks in odor to keep the house smelling fresh. Products that use baking soda, like Arm & Hammer, are typically good about reducing odors. Litter scoopers: If you don't have an automatic or self-cleaning box (or one that uses a tray), you'll need something with which to scoop the litter. Litter box liners: Want to free up your time? Liners are a great way to limit the amount of clean-up duty! These products fit in traditional open or closed boxes. They are simply bags that effectively hold litter in a pan. When it's time to change the litter, simply tie up the lining bag and throw it away. 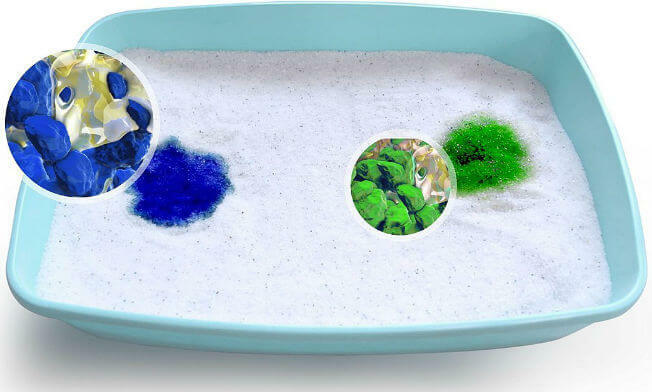 Litter box mats: Mats also help reduce mess. They go outside a box and catch litter that kitty tracks out when she exits. Owners can shake the litter out of them for simply easy cleaning. Litter box trays: Owners who want something easy to clean might want to consider these products. Some litter pans have a compartment for a litter tray that catches waste. It slides in and out easily for cleaning and maintenance purposes. These items all come with their own utility, and may be beneficial for your cat depending on the kind of box you buy. Think of these as aids to the boxes, not as complete solutions themselves. 2. No one wants Fluffy to get sick. The longer a cat's waste sits in a box, the more likely it can cause illness in cats, other pets, or even humans. Toxoplasmosis is a dangerous virus contracted via contact with cat poop, among other ways. Those who are pregnant or sick should avoid cleaning a litter box at all times, as they are most at risk of contracting this virus. How do I clean a litter box? You will need to take time out of every day to clean cat litter boxes. Use your scoop to pick up clumped litter before throwing it away in a proper receptacle. This might be a trash can with a lid, so that kitty can't get into her dirty litter. Wherever the waste is thrown, it should be in a place where pets cannot access it, and it should be away from places where people might come into contact with it. Then, wash your hands thoroughly. Before cleaning, put on a pair of rubber gloves as well as a medical mask. (Keep your gloves on throughout the entire process.) Throw out all of the old litter, even if it appears unused. After all, unused litter has still come into contact with used litter, and is therefore contaminated. Then, scrub the box with clean water and a cleaning solution that is non-toxic for pets. Dry off the box, and fill it with fresh new litter. Pet parents should scoop litter boxes once a day, at least. Additionally, it is recommended that you completely clean out the box at least twice a week. It may sound tedious, but it's extremely important for you and your cat's health to do this diligently. It might be hard, but try to think of litter box maintenance not as another chore, but one of the best ways to keep your cat happy. There are a lot of times when you just need to simply clean, and it may seem like an annoying process. However, it's what makes your cat satisfied and healthy, so she can do the things she loves. Choosing the best cat litter box does not have to be a complicated process! Hopefully, we've simplified some things here for you in this guide. Armed with this new knowledge, you'll know how to buy the purrfect litter boxes for your feline companions!